Horse temperament typing has become a way of life for me. Each one of my horses gets fed and managed as an individual with a diet based on his temperament and each is thriving with this approach. In the past however, my milk goats on the other hand just get pellets. I put out free choice goat minerals and kelp but otherwise they didn’t get anything special. How did this work for the goats? Not so well. This changed when I started temperament typing them. I have typed each of my goats. Sally is a Fire/Wood(Shao Yang), Sissy is Earth, Calico is a Fire and Dixie is Shao Yin(Fire/Water). Dixie, as a Shao Yin, is not pushy and she does not always get her fair share of food. Sissy as an Earth tends to get overweight unless she is being milked. Sally is the top in the pecking order and she likes Calico and protects her so they both get plenty to eat. When Sissy is in milk it is actually hard to keep weight on her because, just like an Earth temperament horse, she does not always assimilate well. She could not eat enough alfalfa to meet her energy needs in the time it takes to milk. 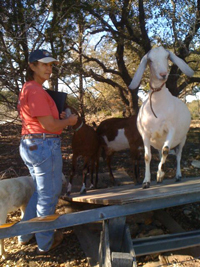 I don’t like feeding a goat lots of grain any more than a horse because they can get laminitis. When Sissy lost weight from heavy milk production I took into account that she was an Earth goat and put her on extruded feed and some grain. The extruded pellets were very easy for her to digest and I was able to milk her for another few months and have her hold her condition. I think goats are a little better than horses to choose what foods are best for them. Sissy will hardly touch the kelp which is not surprising since too much kelp can cause some dampness in Earth temperaments. Too much dampness can show up as a tendency to get parasites or fungal type infections. Dampness in the gut will create a thick layer of mucus that not only attracts parasites but interferes with assimilation. So Sissy is smart to limit her intake of kelp. Sally and Calico both love the kelp and eat almost all of it when I put it out. Luckily my goats get some browse even with this drought. I see them out chopping down on the cedar and my fig tree now resembles a palm tree. Sally will get sore feet if she eats too much grain so even when she is in milk I give her mostly pellets and beet pulp. She can wolf down the alfalfa and she does well on it. Calico is just a year old but looks like she will enjoy the same foods that Sally does. Dixie is doing fine right now but due to have kids any day and she will need way more feed to keep up with her milk production. I will certainly have to separate her to make sure she gets her fair share. As a Shao Yin, once Dixie has her kids she may need some extra digestive support in the form of the prebiotic, Ration Plus.